There are around 50,000 people living on Ko lanta during the season (October - May) and there are only around 20,000 people live in the low season. Mostly living by resort, tour & services business and the rest is farming and fishery. 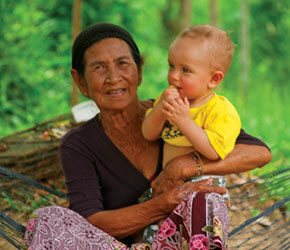 Ko Lanta population mixed with Thai, Thai-Chinese and Thai-Muslim but the different of the culture is not significance. All the people still keep the Thai style living life with Thai hospitality and smail. The southernmost of Ko Lanta has a village called Ban Sang Ga U. Here is the Sea Gypsea village. Sea gypsy were originally a nomadic boat people of Indo-Malay origin who lived a subsistence based fishing livelihood. One can walk through the villages today and realize they seem no different than the average Thai, but they still retain their own language, culture and close ties to the sea. The local Ko Lanta people warm welcome you with our Thai hospitality with smile.